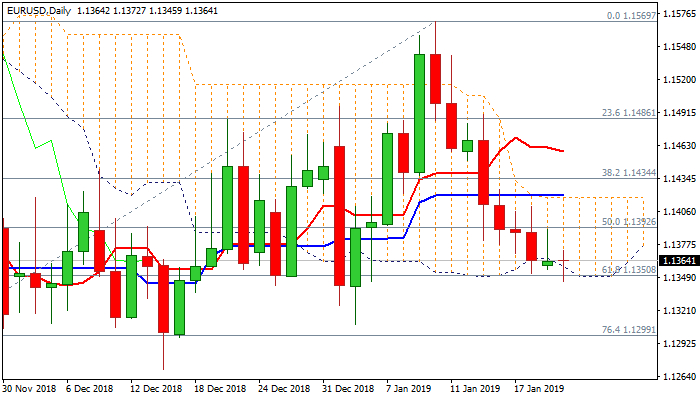 The Euro holds off session low at 1.1345 after fresh bears cracked key support at 1.1350 (daily cloud base / Fibo 61.8% of 1.1215/1.1569 rally). Bears face strong headwinds here as Monday’s action was shaped in inverted hammer, initial signal that bears may be running out of steam. Fresh bullish momentum and deeply oversold slow stochastic support reversal scenario, but south-heading MACD and MA’s in bearish setup, weigh and partially offset reversal signals. Also, downgrade of global growth forecast that sparked fresh risk-off mode, keeps the Euro at the back foot and negative sentiment could be further soured by German ZEW data today (economic sentiment Jan f/c -18.4 vs -17.5 in Dec). Scenario on firm break below 1.1350 pivot would signal fresh bearish acceleration towards 1.13 (Fibo 76.4%) and would risk extension towards key support at 1.1215 (12 Nov low). Alternative scenario sees return and close above 55SMA (1.1380) as a minimum requirement to sideline immediate bearish threats and expose a cluster of daily MA resistances / daily cloud top (between 1.1398 and 1.1424) break of which would confirm reversal.